Headliners are "Sewn Ready to Install, Tailored to Fit". 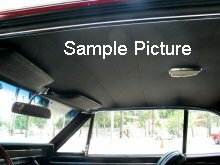 Metal bows are transferred from old headliner. There is a center line drawn on the back side of headliner to assist in alignment. There is 3" of excess material all around perimeter for stretching and trimming.